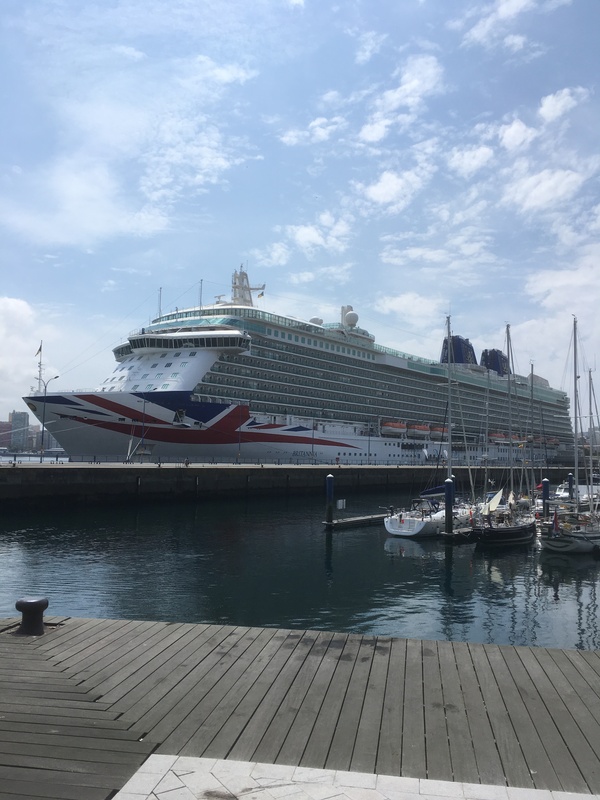 The town has a large cruise ship terminal attached to the marina in the town, we were amazed to see how big the P&O ship “Britannia” was sitting alongside for a day! The much talked about rias of Spain were around the corner and our first was Camarinas. 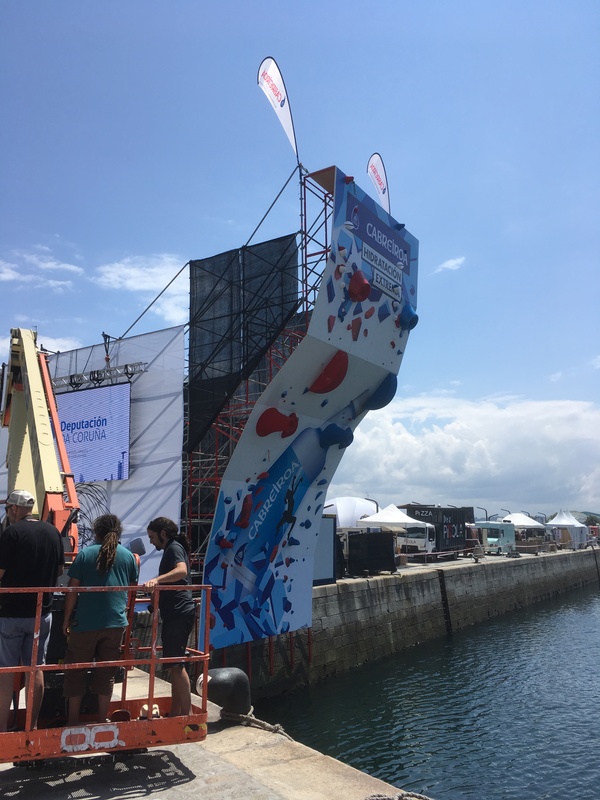 The wind was a very light 10 knots until we turned into the ria when it suddenly increased to 28 knots and caught us out, having too much sail out, reefing the genoa away a block caved in making life a little interesting for a minute as we carefully winched the sail away safely…. more lessons learned! We anchored in the northeast corner of the ria off a small beach and stayed there for 2 nights in beautiful scenery. Click on the above panoramic to see how lovely Camarinas is !!! Caroline & Charlotte even braved the cold water too! The town although small had 3 small supermarkets well stocked 5 banks and lots of tapas bars. 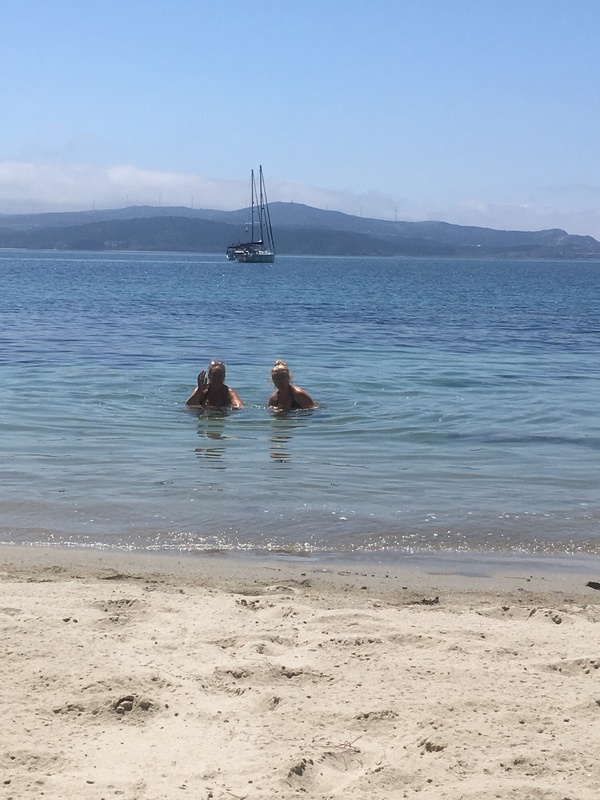 We could have stayed much longer, but wanted to get past Finisterre in good weather. The call this area Costa da Morte … coast of death for good reason. So many ships have been lost on this coastline in bad weather, we had no intention of joining them so another light wind sail it was. Uneventful until we saw a fish pot at the last minute with a floating line to another some way away. Watching the pot line get snagged in our keel is very worrying, we quickly turned 180 degrees to stop Silhouette then another 180 and luckily watched the marker fall away. 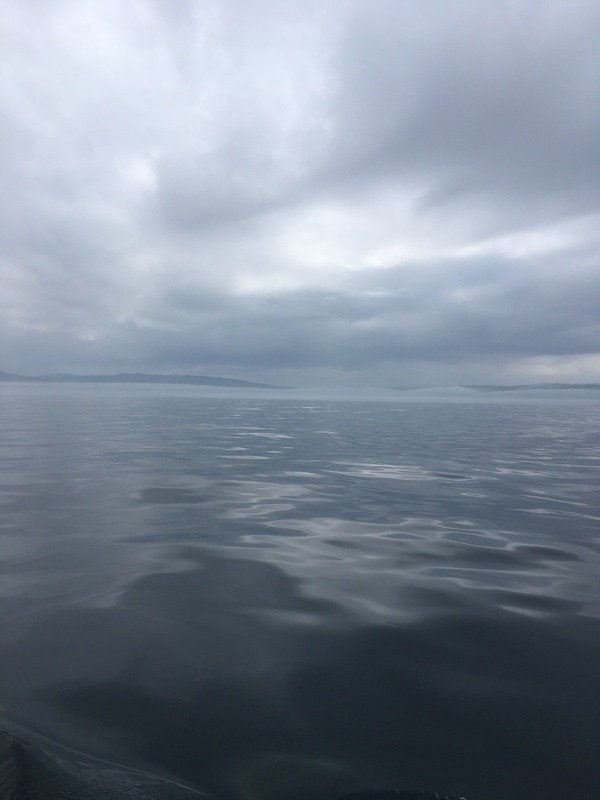 Passing Finisterre in calm weather but in the ever present sea fog. Our next Ria was Muros and we anchored just to the north of the marina in 15 metres, totally protected from the winds. 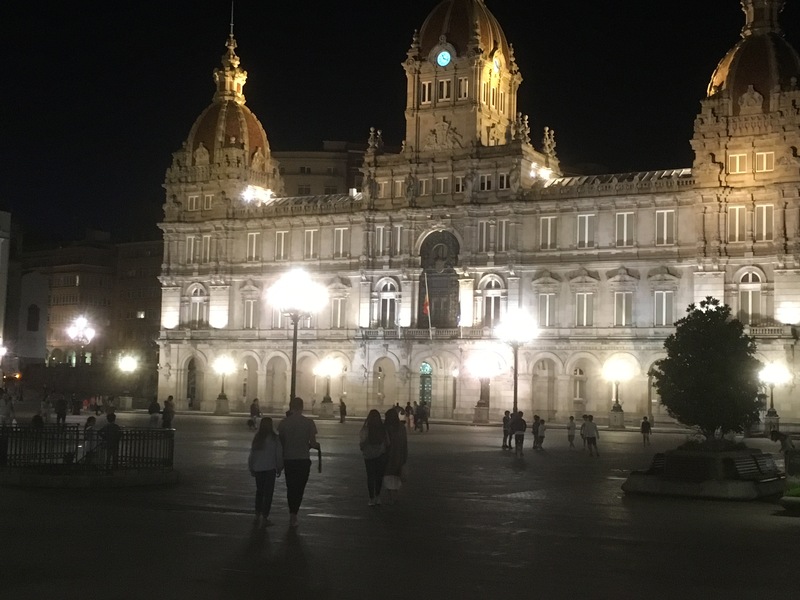 Spending 5 nights there, we caught up with Nick & Carol on Sea Spine who had started their return to the UK in preparation for them flying out to Las Palmas to sail to the Caribbean with us. We have also noticed how many yachts we’ve seen before & take time to say hello. Their plans vary, most are turning into the med but one Swedish yacht with 3 very young children are heading to the Caribbean via Cape Verde so we expect to see them along the way. Currently we’re anchored in a small bay by a tiny marina in Bueu Ria de Pontevedra avoiding some strong southerly winds. 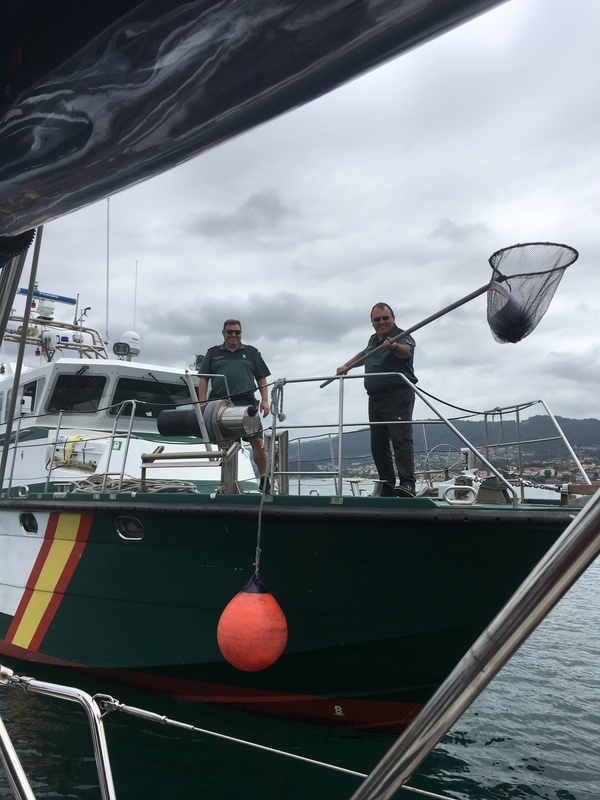 We were checked by the marine police AGAIN and this time handed our papers over via a net !!! All smiles and very courteous. Previous Previous post: Rias ! Next Next post: New courtesy flag!